This post will be somewhat autobiographical and is inspired by a recent discussion on Facebook about siblings sparring against each other at competitions. at around 24 years old. In the middle, Abrie, one of our friends at the time. My brother and I started Taekwon-Do together, hence we were at the same rank for most of our early martial arts careers. (He stopped at 3rd degree, but I'm still going.) Although he was older and heavier than me, we still ended up having to compete against each other on several occasions. As colour belts, I personally found it very hard to compete against him in sparring and only won against him one time -- and according to him it is because he let me win. His perspective may very well be true, as the idea of purposefully hurting a member of my family is something that I never could feel comfortable with (and still don't). I'm older and much more experienced now, and have the control and skill to spar against someone without ill-intend. This is something I didn't have when I started TKD. 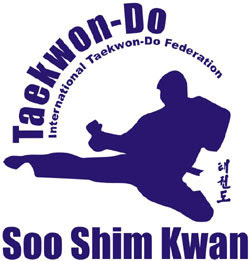 My parents were not very involved in our Taekwon-Do careers, so in our case, the decision was left to us. Thinking back, I found it traumatic to spar (it felt like fighting, not sparring) against my brother and I think that for me personally it would have been better not to have compete against him in sparring. I didn't have the maturity to be able to differentiate between fighting and friendly competition. My brother on the other hand was far less sensitive than I was as a child, and I don't think it affected him much at all. It is very likely that my inability to differentiate between friendly sparring and a fight had to do with the history of my brother and I, rather than only my immaturity at the time. My brother is much older than me (7 years) and when we were younger--that is, before we started TKD--he used to bully me. Hence, for me personally it was difficult to differentiate between friendly sparring and fighting when it came to the two of us. I don't think I usually had the same trouble of differentiation when I sparred against other people. There was only one time that I can remember, around the same time as the picture above was taken, that the sparring turned into a fight. During the competition, right as we started the round, my opponent cursed me because I had beat his friend in a previous bout. I lost my temper and went quite hard; I broke his jaw and he had to be rushed to hospital with a bad concussion. Not one of my proudest moments. Again, this is an example of how, as a teenager, what was simply a sparring match became a "fight" when the other kid made it "personal". Thankfully, I'm not generally a violent person by nature and have seldom had such experiences of losing my temper again. With time and maturity comes calmness. With this in mind, would it have been better if I did not partake in sparring until I learned to differentiate between sparring and fighting? Apart from the martial arts which I started as a teenager, I never did other contact sports as a child, nor had I other rough-and-tumble opportunities with my father or older males. I think a child learns to differentiate between "play fighting" and "real fighting" in these contexts and because I missed out on such opportunities I learn those lessons much later in the dojang. So, no I don't think it would have been better were I not to have been exposed to sparring. I think it served an important function to teach me social concepts like physical contact, hard play, and healthy competition over "fighting". While I do think sparring was good for me, I also think sparring my brother was not good for me (or us). So, should siblings (children) spar each other at tournaments? It may be better to speak with the children individually and privately to assess how they feel about it. If they don't have problems with competing against each other, it shouldn't be an issue. However, if it makes one of them feel uncomfortable, I'd suggest that other ways be found, for instance letting them compete in patterns, or in other divisions. Also, if one child already feels inferior to his or her sibling, having the kid lose yet again against the better (often older) sibling is not necessarily a good idea. In fact, parents often think it is good to have their kids participate in the same activities, but that is not always wise. Some children need to find their own unique activities to excel in and not always be in competition for the same thing with their sibling(s). A wise parent knows that their children are different and requires particular parenting. Literally decades later, and I am still of the opinion that the competition between my brother and I was not a good thing. I believe it affected our relationship negatively in more ways than one. At the same time, I'm very thankful that my brother and I took up Taekwon-Do together. We are very different people with regards to our characters, worldviews, political opinions, and most other aspects of our personality. The martial arts, however, was something we had in common -- a love we shared. I'm certain that had we not started it together, I would have been unlikely that I would have enrolled by myself. I was an introvert. Thankfully, my extroverted brother's enthusiasm had me excited enough to try it too. As a colour belt, there were many an evening that I didn't feel like going to training, but my brother encouraged me and set an example for me. I am appreciative of that. Now, about 25 years later, my brother has long since stopped formal martial arts practise, but I'm still hooked. I sometimes wonder how it would be not to do martial arts, but the very idea seems too strange to imagine. Martial arts have become so much a part of me, there is literally not a day that goes by without me thinking about some aspect of it.